With the Holiday season rapidly approaching, your plate of things to do is piling up. There are so many things competing for your attention – traveling, hosting, shopping, parties, baking and more. On top of those items, you also have work at the office to attend to! So, it’s easy to lose focus and get overwhelmed over the next few months. You don’t have to sacrifice your productivity and your sanity to have a wonderful Holiday. 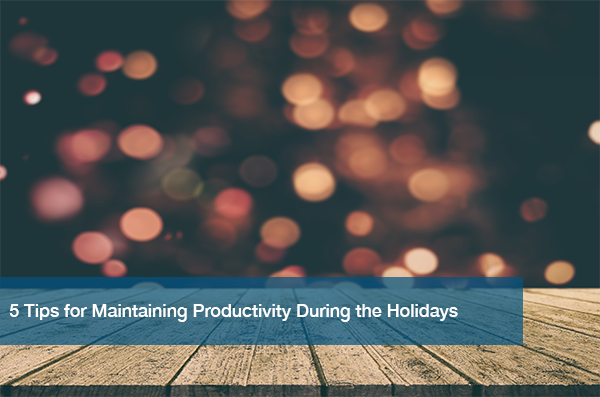 There’s many easy solutions that will help you stay on top of your work this Holiday season. You know better than anyone else what you can handle. So take care of yourself! Don’t feel like you have to make every party or take part in every potluck. It’s healthy to say no every once in a while. But, this doesn’t mean have zero fun. Recognize your work load, and make your commits based of that! Holiday time means vacation time! Your office mates are surely taking some time off (maybe you are, too! ), which means a quieter office. Don’t let this time be a waste. Use it to knock out the less important tasks you’ve been meaning to get to. Your dedication is sure to stand out to management and beyond. Before the season even begins, you should write down all the tasks ahead of you (both professional and personal). Once you see all of your to-do’s laid out, you can set an agenda for yourself. Right away, look at what you can put off and what’s a priority task. That way, you have a game plan to rely on. We all have things at home we have to take care of during the Holidays. Don’t let your work at the office stand in the way! Set clear goals for yourself at the office, and come to sensible stopping points. Your family will be sure to thank you for it. Let’s not forget- the Holidays are meant to be a positive and happy time. Yes, you may have a lot to get done. However, you deserve to refresh and recharge! Use those days off you have saved up to knock out your shopping and cooking. Take the time to clear your mind and enjoy the time with your loved ones. Your key to remaining productive this Holiday season is organization. It’s almost impossible to avoid some sort of stress during this time of year. However, you can reduce your risk by planning ahead. Through all the personal and professional tasks you need to get done, don’t forget to enjoy yourself! If your business wants to remain productive all year long, it’s important to have IT support that will allow you to do so. At ITC, we understand how valuable your time is. That’s why everything we do is to help businesses by supporting their IT, saving them time and energy. Head to our website to schedule your free IT needs assessment so we can help you maintain productivity today.